Sun-dried tomatoes are exactly what their name implies: tomatoes that have been dried in the sun. As a result, the tomato loses most of its liquid content, leaving it shriveled, somewhat chewy, oddly shaped, and dark red in color. So they either need to be reconstituted, or packed in oil. Once dried, the tomato's flavor becomes much more intense, so sun-dried tomatoes shouldn't be substituted one-for-one in a recipe. When buying sun-dried tomatoes you will have the choice of dry-packed tomatoes or oil-packed tomatoes. The dry-packed are sold in the same manner as dried fruit and will need to be reconstituted before using in recipes where they won't be cooked in a liquid, such as salads or when they're made into a spread. You will find oil-packed sun-dried tomatoes offered in several different ways—the tomatoes may be whole, chopped, or julienned, and there might be herbs and/or spices added to the oil. Read the label on the jar carefully before purchasing to make sure you are buying what you need. Unless they are already packed in oil, sun-dried tomatoes will need to be reconstituted before use (unless they are being cooked in a liquid). This is a pretty simple process: Just let them soak in warm water for 30 minutes until soft and pliable, drain (reserve the liquid to add flavor to stocks and sauces), pat dry, and use as directed in your recipe. You can also use wine, broth, or other cooking liquids to reconstitute. Once reconstituted, use them within several days or pack in olive oil and store in the refrigerator for up to two weeks. To reconstitute sun-dried tomatoes in oil, simply place dried tomatoes in a jar, cover the dried tomatoes with oil, and refrigerate for 24 hours. To use oil-packed sun-dried tomatoes, drain the tomatoes from the oil before eating or adding to a recipe. Always be sure that those tomatoes left in the jar are completely covered with oil, which may mean adding more oil as you use the tomatoes, and be sure to store in the fridge. And don't toss out that oil when you are done with the tomatoes—it will pick up flavor from the tomatoes and be delicious in salad dressings or used for stir-fries and sauteed dishes. The flavor of sun-dried tomatoes is quite intense, concentrated, and slightly salty, so a little goes a long way. 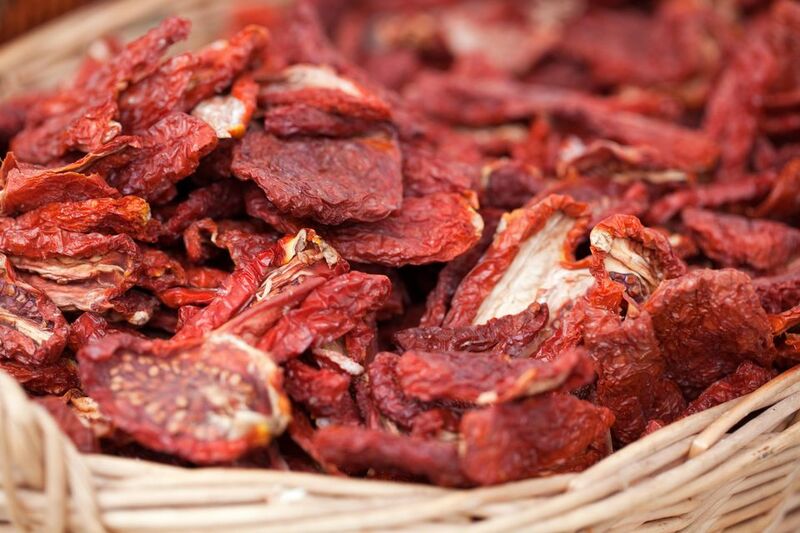 Many people, especially children, enjoy eating sun-dried tomatoes as a snack out of hand. Although they are wonderful with pasta, sun-dried tomatoes are also tasty with many other foods, including vegetables, meats, and even bread. Whether you have an abundance of tomatoes from your garden, or just want to try your hand at drying your own, making sun-dried tomatoes at home isn't all that difficult. You can do it the way the Italians have been doing it for years and place cut tomatoes out in the sun for four days or so (there are a few pieces of equipment and some precautions you need to take), or you can dry the tomatoes in the oven or in a food dehydrator. All methods will provide satisfying results.